On Monday, I showed some examples of how neutral interior paint colors can add a lot of depth and dimension without being too flashy. But, I know, some of you love bright color. I do too. So to quench your thirst for interior painting palettes that make a statement, here are some great ideas and pictures to inspire your interior painting project. When choosing vibrant color, be inspired by the world around you. Look at how colors complement each other at your local farmers market, at a floral shop, or just about anywhere else. You might be surprised at the color palettes you find that would transfer perfectly to your walls. I like the combo of these two colors. I would never think of using two such similar colors together, but it reminds me of Monet's house in France and a color he would have used to paint lily pads. 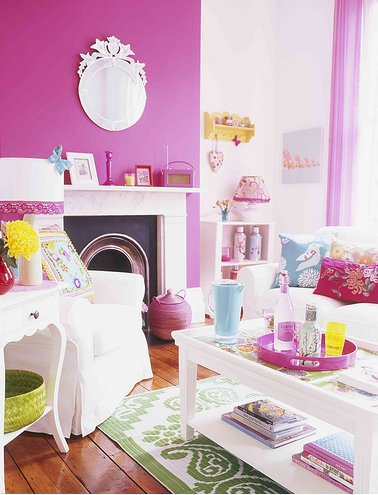 This might be too feminine for some, but I love the playful use of pink accessorized with all the colorful knickknacks in the room. Not sure what kind of paint will suit you best? You can take an online paint personality test. It may make your interior painting decision a little easier. This entry was posted on Wednesday, July 09th, 2008 at 05:07 pm and is filed under Painting . You can follow any responses to this entry through the RSS 2.0 feed. Can I texture the paneling in my living room? What's the best way to paint concrete walls? What's the best way to paint interior walls? How can you tell how many coats of paint were put on a wall?